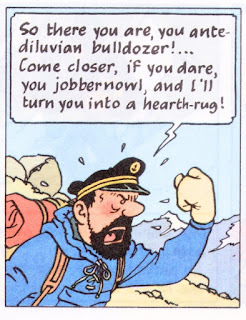 What if Captain Haddock from Tintin comics got troubled by the terrible termites. What curses he would have mouthed at them? 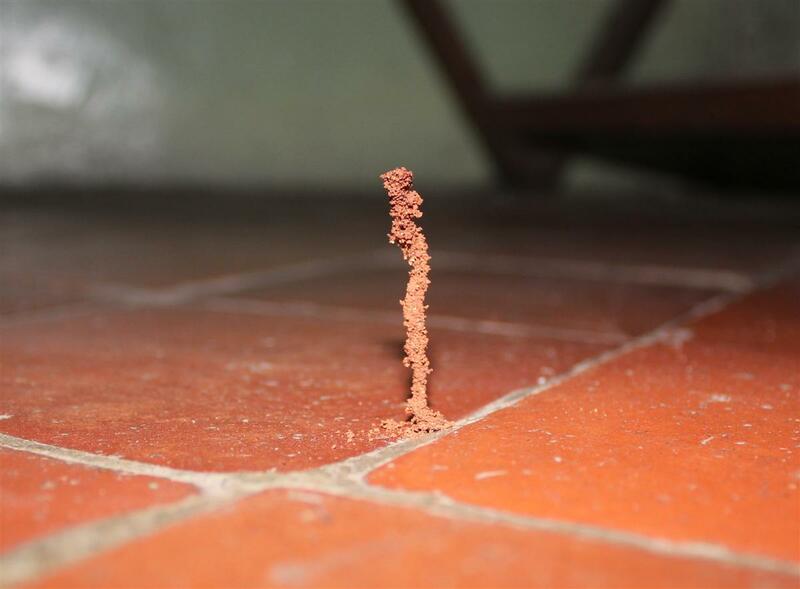 Termites are home owners' foe. But nothing in Nature is 'unpurposefully created'. They aerate the earth with their underground channels. We are living in their land! Here is a brief list of ten facts about termites. [Click to read, informative]. 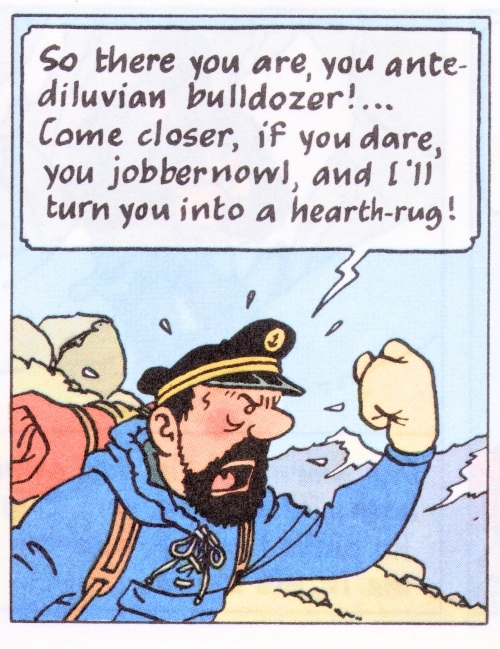 I only imitate Captain Haddock with just a couple of curses when I see termites damaging wood and paper at home or in the Yarden. They can do immense damage. They can even reach wooden rafters and reapers as I noticed in our century old tiled roof. It was 20 feet high. I wondered how they went so high rising 'through' the walls! But when another old smaller structure in the premise was demolished, their handiwork was on view. Let me show some pictures. Removal of roof tiles exposed the work of termites on rafters resting on walls. Look at the reaper. 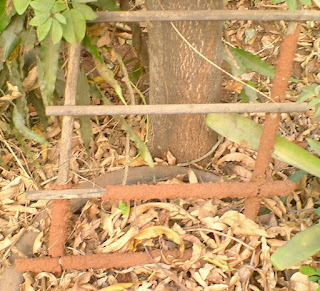 Teak is said to be termite resistant because they do not like the oil in it. When the oil dries up with ageing of wood, they will be vulnerable. There were many rafters eaten up by termites and some were precariously close to collapsing! This one had been lowered carefully and I observed something here!! So I asked the carpenter to cut the portion carefully. Then I happened to find many damaged ones in the lot and set aside all those that had some appeal, before the wood was taken for resizing for reusing the fine teak wood required for the new house that has now come up. I had kept the others aside, as if on display. 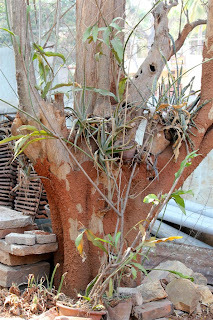 Now this is what I created from the great sculptures created clandestinely in the walls by the 'thundering termites'. The set becomes a part of my Yarden. I nailed all of them in line to a termite damaged reaper which formed a base and rested on two nails on the wall. There was another termite torn plank that also went up on show. The badly defaced pieces were used for the hot water boiler as fuel. This is the 'Sculptor'. Many thousands of them will be working on shift basis! Group Picture! Closer view of my latest 'Junk Project'. That was the purpose of this post. Now let me show how dangerous and what a nuisance these can be. There is no guarantee of any wood or item containing cellulose to survive. If they are not moved or noticed, they can eat up the whole thing. This was a 2 1/2 inch 'Termite Tower' risen from a little crack in our room floor. They had completely eaten the books in a book shelf that was not noticed for about 2 months! Many books were lost that way. They had come up through the wall and the shelf was embedded in the wall. Some wood kept for a week were attacked. Look how they come up through the gaps in the floor. A toy bat had a lot of cellulose!! 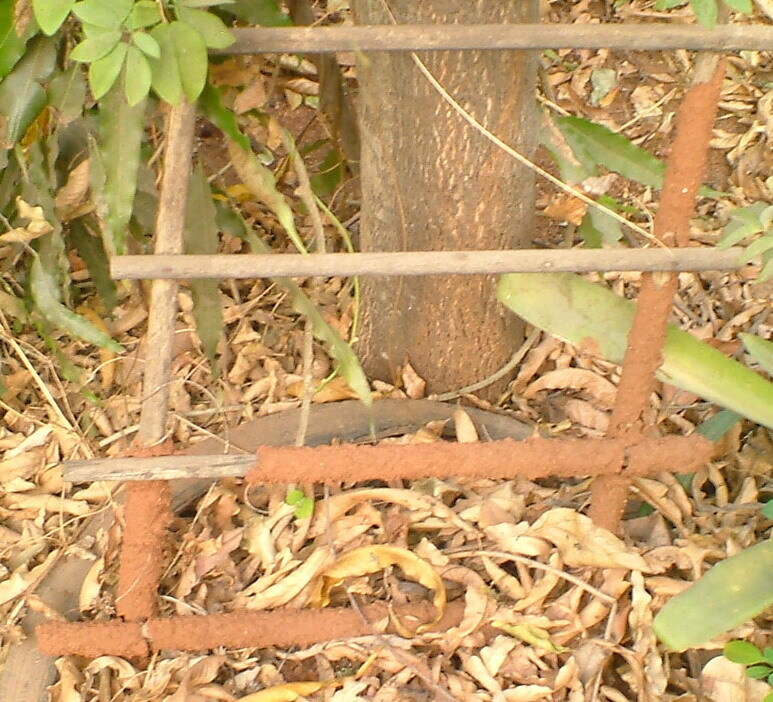 A simple trellis I made was damaged some years ago. They attack the bark of trees. 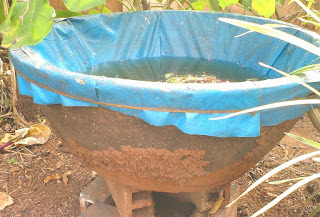 An old wooden tub attacked from its base, despite keeping on bricks. Since it was noticed soon, it could be saved. An old radio cabinet, junked but not disposed, suffered. They had come through the crack in the old wall. A piece of torn rattan from a junked chair deliberately kept on the ground to see if they attacked, was surely attacked - in 4 days! As such, I do not use much wood that touches the ground, in my Yarden. Jobbernowl! That just about says it all, when it comes to your voracious termites!! Love the Termite Art. Only you would think to put it on display!! Junk-Unjunk indeed!!! !